A quick refresher course on the new playoff format tells us that should we finish third in our conference, we will be faced with a quarterfinal trip to the team that finished second in Conference A, which could very well be Munster. That is not a path I would choose for even a team with Leinster's talent, so while we should be looking up at the Scarlets in first place as a team we'd like to catch and go straight into a home semifinal, we can't afford to ignore the Ulstermen who are just six points behind us and this makes victory today every bit as important for the boys in blue as the those that have come already in this festive interprovincial series. And it has to be said, for a team naming it's third matchday squad in just eleven days, this is quite an impressive Leinster selection. 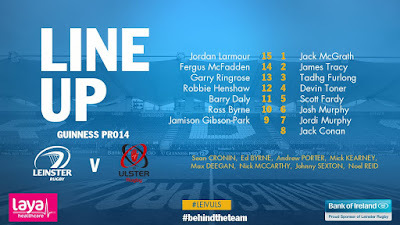 I have to say though I am both delighted and anxious in equal measures to see our pivotal 'Henrose' centre pairing in action...great that they'll have some game time together and we'll need all of their ability to snuff out the attack points of a quality Ulster back line, but since it's key they both remain fit right to the end of March there may be lot of fingers crossed around the RDS on Saturday throughout. But no matter how much talent Ulster enjoy from 10 to 15, they'll need the ball first and assuming Leinster had keep set piece errors to a minimum then the breakdown [and George Clancy's interpretation of same] is where the match will be won or lost, with Henderson v Fardy probably the pick of the one-on-one tussles. I see both teams have their top goal kickers on the bench...John Cooney has done extremely well filling the massive boots left behind by Pienaar while all Leinster and Ireland fans will be hoping that 'Johnny22' won't be needed at all. Should you be calculating odds for this one, the bookies say Leinster are meant to win by 16 points but I take that margin with as much of a grain of salt as I did the Connacht match. The derby nature of the contest plus the visitors being both on a high and more motivated than most to get a win at this venue could well keep this close. My spidey senses are telling me that we can both win and deny them the losing bonus, though if so it will probably take a late score and we could be in for another tackling battle so four tries would be a welcome yet unexpected bonus for me. Seven- to nine-points in Leinster's favour I say. Replacements (16-23): R Herring, K McCall, W Herbst, A O'Connor, N Timoney, J Cooney, J McPhillips, T Bowe.